On average, a three-ounce serving of lamb has only 175 calories and meets the Food and Drug Administration’s (FDA) definition for lean. According to FDA guidelines, lean meat has less than 10 grams of fat, less than 4.5 grams of saturated fat, and less than 95 milligrams of cholesterol per 100 grams or 3.5 ounces. 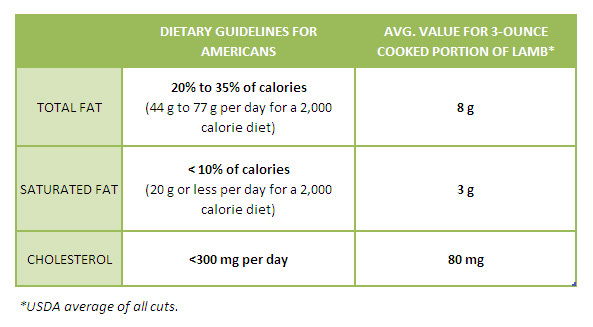 As the chart below indicates, three ounces of lamb can easily fit within the daily fat, saturated fat, and cholesterol recommendations of the 2005 Dietary Guidelines for Americans. 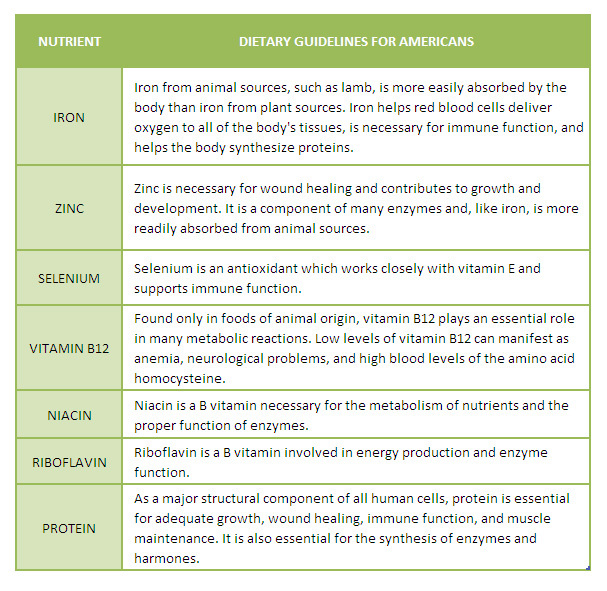 Because lamb naturally contains many essential nutrients, it’s an easy fit for healthy diets. On average, lamb is an excellent source of protein, vitamin B12, niacin, zinc, and selenium, and a good source of iron and riboflavin. All of this within an average of 175 calories per 3-ounce serving makes lamb naturally nutrient-dense. Copyright © 2019 The Lamb Cooperative. All Rights Reserved.